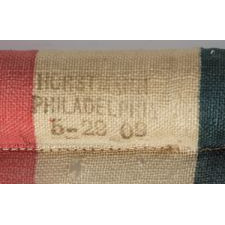 American military camp colors are rare in the antiques marketplace. 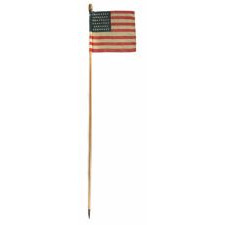 These little flags, generally the smallest used for military purposes, stood outside tents to mark encampments. The staffs that they were affixed could be rather massive by contrast. Some were thick, tapered at both ends, and stood about eight feet in height, like the remarkable one still affixed to this 46 star example. 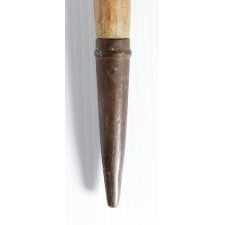 Terminating in an acorn finial, note how the tapered brass tip at the bottom would allow the staff to be more easily driven into the ground, provided the earth was soft enough to accommodate. When attached to the flag, the staff was slipped completely through a wide, open sleeve along the hoist end and tacked in place, as seen here. Camp colors were also used for military drilling within the encampment. 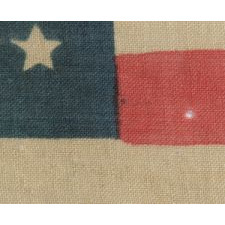 More innocuous than traditional battle flags and guidons (flank-markers), camp colors were typically not painted or embroidered with unit identification and were not saved and recorded with the same consistency. They were probably seldom carried in parades like their battle flag counterparts, or displayed in armories and veterans' halls. 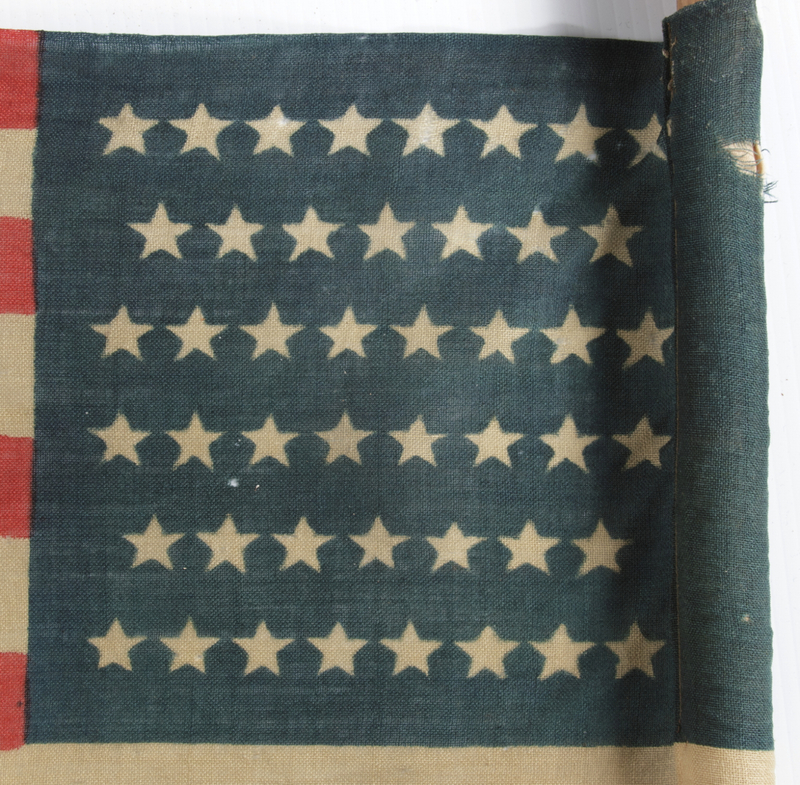 I have been privileged to own a small handful of Civil War period camp colors over the years, in both the 34 and 35-star counts, in a style that matches identified examples in the New York State Military Museum. 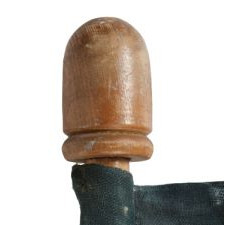 They also match a pair of flags in a private collection, which are tacked to their original wooden staffs that have embossed metal labels from the maker, specifically identifying them as camp colors. A 13 star example with the same style of construction is also known. All have precisely the same manner of construction and are in a similar size, measuring about 1.5 feet on the hoist and 24" or so on the fly, sometimes slightly less, and with a presentation that is nearly square. Made of press-dyed wool bunting, there is an integrated sleeve along the hoist end where an unusual amount of extra fabric was rolled back onto itself, lined with cotton or linen for strength, and stitched into place. The stars of this example are arranged in rows of 8-7-8-8-7-8, which is the most common configuration found on flags with the 46 star count. This is the only camp colors in this style that I have ever encountered in a star count outside 34, 35, and 13. 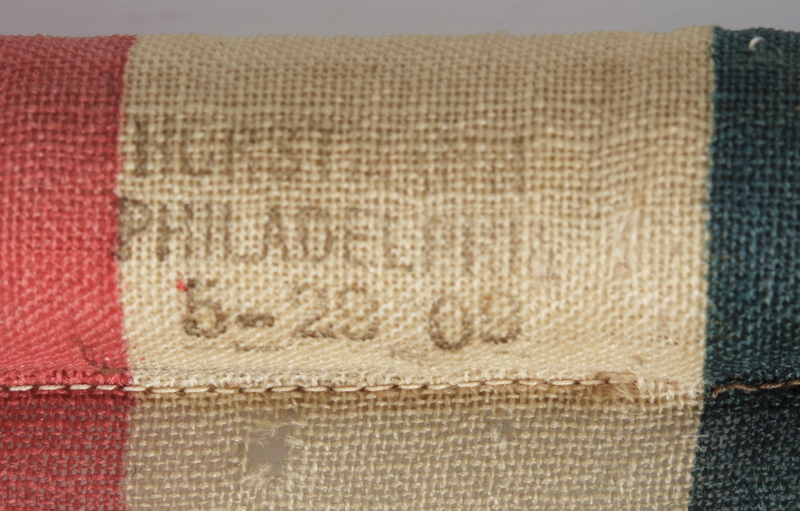 Made in Philadelphia by Horstmann, it is signed with a stamp along the hoist, in the first white stripe below the canton, where it is also dated "5-29 09." 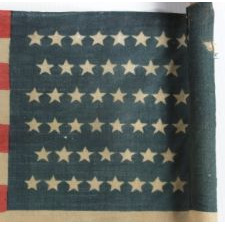 Horstmann was a known source for press-dyed flags during the second half of the 19th century. The 46th state, Oklahoma, joined the Union on November 16th, 1907, during Teddy Roosevelt’s presidency. Roosevelt had many friends in the Oklahoma Territory from his Rough Rider days, and pushed it through to statehood. 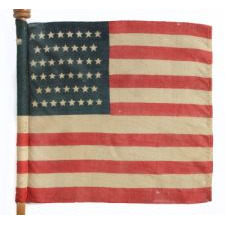 The 46 star flag became official on July 4th, 1908 and remained so until July 3rd, 1912. 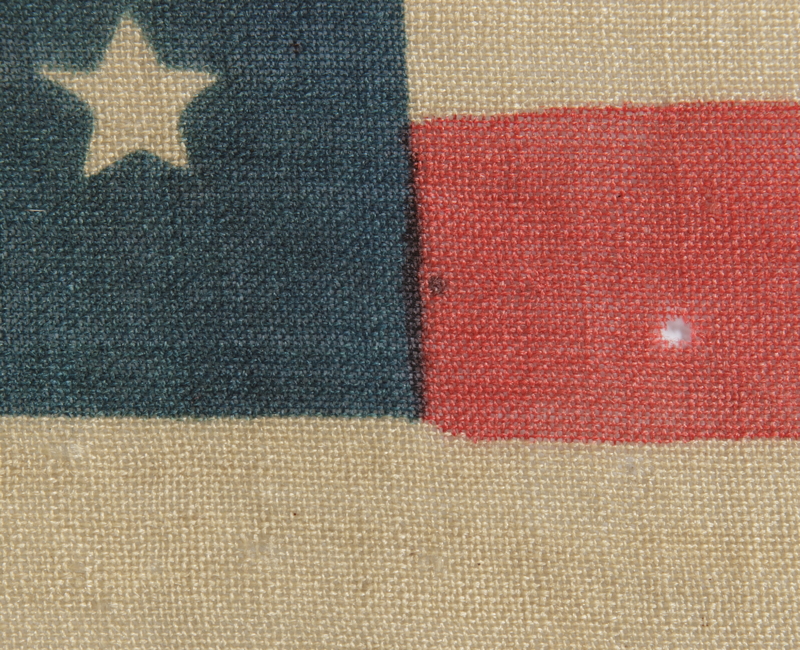 Many 46 star flags were made earlier, however, in great anticipation of the future addition of the state, which had previously been appointed to Native Americans. William H. Horstmann (1785-1850) was the founder of what would become a major military outfitter in both Philadelphia and New York City. A solider and fourth-generation passementier (textile weaver), he emigrated to the United States from Germany in 1816 and settled in the Germantown area of Philadelphia, where there was a significant concentration of textile manufacture. There he married the daughter of the most successful lace manufacturing firm, and started his own business in coach lace and military goods at the corner of 59 North 3rd Street. He imported looms from Germany and elsewhere and maintained a regular trade with his family in Europe. The company grew exponentially in size and had many addresses over its years of operation. In 1828, the William H. Horstmann Military Store opened. In 1843 it became William H. Horstmann & Sons Military Store, and in 1859 it was taken over by sons, Sigmund H. and William J., and began to operate as Horstmann Bros. & Co. 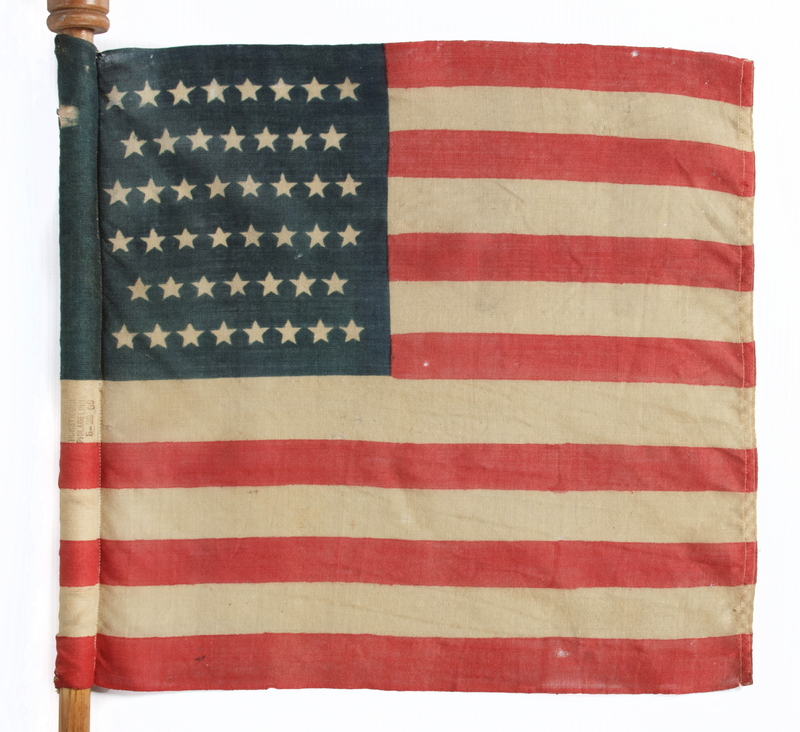 The company manufactured its own goods, including flags, swords, drums, insignia, and many other items, and it subcontracted their manufacture as well, depending on financial sensibility. There were investors along the way, such as William S. Hassall and George Evans, who broke off and began their own large and successful firm. The New York branch changed its name in 1877 to that of a Horstmann partner, H.V. Allien, in 1877. Both Philadelphia and New York branches filed for bankruptcy and closed in 1948.